1994 – Winning Futures was founded by Sam Cupp, a successful entrepreneur, in the Warren Consolidated School District in Warren, Michigan. Sam’s illustrious career began with the help of a teacher (Dominic LaRosa), a counselor (Austin Hartshorn), and a businessman (Gene Hamilton) working together for the best interest of their student. In turn, he wanted to give back to his community and created a program that could initiate this type of partnership for students. 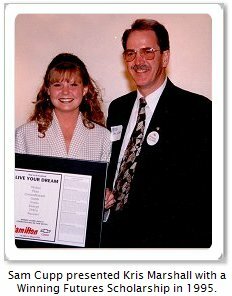 1998 – Sam’s first mentee in Winning Futures, Kristina Marshall, was hired by the program and is now its president and CEO. 2000 – Sam retired and turned the organization over to Kris Marshall and Laurie Tarter (Vice-President) to lead and grow. 2003 – Winning Futures founded the Metro Detroit Mentor Collaboration (MDMC) to aid Southeast Michigan mentoring programs in reaching their greatest potential by partnering veteran programs with new initiatives. The MDMC meets bi-monthly to discuss ways to improve, enhance, and strengthen mentoring in Southeast Michigan. 2004 – Winning Futures expanded to the Oak Park School District through a partnership with the Oak Park Business and Education Alliance. 2004 – Winning Futures began selling its life skills workbooks and training guides to other mentoring programs and schools. 2005 – Winning Futures began operating school-based mentoring programs in the Highland Park School District in Michigan for elementary students. 2005 – Winning Futures began operating school-based mentoring programs in the Pontiac School District in Michigan for high school students. 2008 – Winning Futures has now impacted over 16,000 students and awarded $1.5M in scholarships for youth to continue their education! 2009 – Schools, mentoring agencies, and other nonprofit organizations throughout the country began implementing the Winning Futures Workbooks and Activities into their youth programs. Winning Futures begins running the RARE Foundation, founded by Gil Cox. 2010 – Intern Connection program begins at Warren Mott High School with SRG Global, partnership created with POH Medical and United Way for Southeast Michigan at Pontiac High School. 2011 – Winning Futures teamed up with the Michigan Sports Hall of Fame to record commercials with Jerome Bettis, Lloyd Carr, and Ray Scott, launched a new program with iMatter for Kids at Pierce Elementary in Birmingham, and started hosting mentoring programs in Detroit Public Schools (DPS), including our Greg Kelser Basketball Camp for 80 Detroit 8th graders. 2012 – Winning Futures’ program expands into Cass Technical High School (DPS), Madison High School, University Prep Science and Math High School (Detroit), and Jalen Rose Leadership Academy (Detroit), our founder Sam Cupp passes away, and the biggest, most successful Corks & Forks charity wine tasting yet is hosted. 2012 – Our founder, Sam Cupp, unexpectedly passes away. Winning Futures programming expanded into Madison High School in Madison Heights, University Prep Science and Math High School, and Jalen Rose Leadership Academy in Detroit. 2013 – Winning Futures celebrated 20 years of mentoring and was the recipient of Crain’s Best-Managed Nonprofit Award. The Keys to College program was launched at Consortium College Preparatory High School, Harper Woods High School, Community High, Madison High and Pontiac Academy for Excellence. The first annual Sam Cupp Impact Award was introduced at Corks & Forks. 2014 – Winning Futures won SASHE’ (Sisters Achieving Success, Harmony, and Empowerment) Best Company for Women Star Award. The Winning Futures program expanded into Madison-Carver Academy, and Cornerstone Health + Technology. The Keys to College program expanded into East Detroit and Van Dyke Lincoln. 2015 – Vice President and Co-Creator Laurie Tarter retired after 19 years of service. Lear Corporation became Presenting Sponsor of Winning Futures. Winning Futures won WXYZ Channel 7 “Detroit 2020” Award. Lawrence Technical University Freshman Orientation life skills program is launched. Keys to College expanded to Western International High School in Detroit. 2016 – In over two decades of programming, Winning Futures has impacted over 46,000 students and awarded $1.8M in scholarships. Achieved mentor retention rate of 72%. Greg Kelser was Winning Futures Partner of the Year Award recipient. Keys to College expanded to Mumford High School in Detroit, South lake High School in St. Clair Shores, and Fitzgerald High School in Warren. Auto News and Winning Futures Implemented a one-day mentoring program at the Leading Women Conference. 2017 – We honored our last class of RARE Everyday Heroes and Scholarship Winners. Mike Fitzpatrick of Fitzpatrick Manufacturing was awarded the Sam Cupp Award and a 20-year mentoring award. Winning Futures received the Promising Practice Award by Character.org. A team of U of M PhD students found that Winning Futures continues to impact students with statistically significant changes in work-readiness skills, self-efficacy, and confidence in their future. 2018 – Winning Futures becomes the first mentoring program in Michigan to earn the National Quality Member designation from MENTOR: The National Mentoring Partnership. 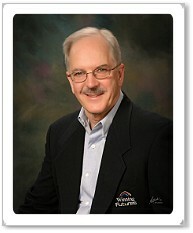 It is with great sadness that we share that our founder, Sam Cupp, passed away on Thursday, June 21, 2012. He died doing something he loved – playing hockey. Our thoughts, prayers, and love go out to everyone Sam ever impacted, especially our Winning Futures family, his grandchildren, daughters Anne and Amy, and his wife Betty. Sam was an amazing man whose character and inspiration will continue to leave a legacy for generations to come.